Williamston, NC Bojangles'® Tands, INC. Store #29 - Bojangles'® / Tands, Inc. Nothing beats the selection of tasty southern food at Bojangles’® in Williamston, NC. Get the comfort food you crave at Willamston’s Bojangles’®, whether it’s fried chicken, Dirty Rice®, Cajun Pintos®, or our freshly made-from-scratch buttermilk biscuits. 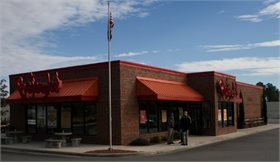 Our Williamston Bojangles’® location is located at the crossroads of 17 and 64. We’re on the way to the Outer Banks, so take a rest stop and fill up at the Williamston, NC Bojangles’®, or grab a Big Bo Box for a portable, tasty meal that will feed the whole group! Bojangles’® is a favorite of Williamston locals and is proud to be a part of their community.